Continuing our busy weekend I was back at the beautiful Old Parish Rooms, Rayleigh for Cassie and Andrew’s amazing wedding! 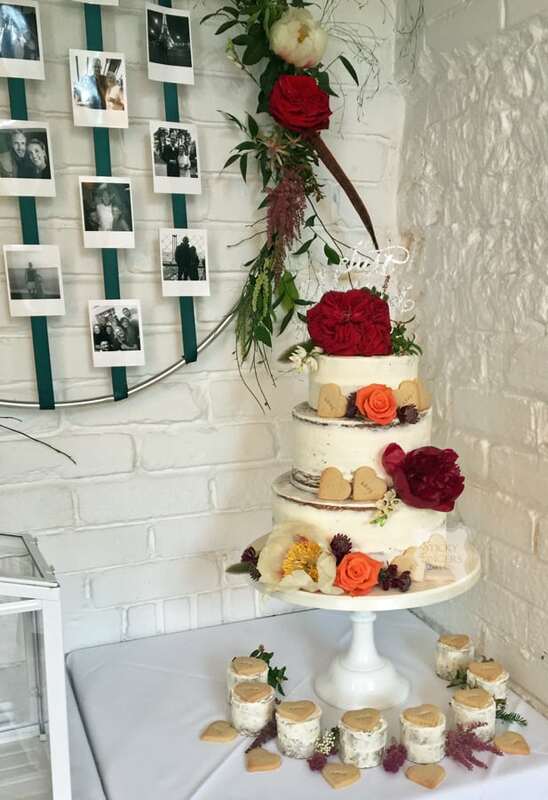 Semi-Naked wedding cakes are becoming really popular and taking over from the more rustic naked wedding cake and Cassie and Andrew had their wedding cake decorated with fresh flowers and displayed on our white American milk glass stand. This was a perfect choice as I also made eight Cookies and Cream mini cakes which were displayed underneath. The flavours for their main cake were Strawberry and Champagne, White Chocolate and Passion Fruit and Carrot and Pecan. The cake was also decorated with cute, rustic mini heart shaped cookies. Sending you both huge congratulations!